Why I liked this product- when I first used it, I felt my hair a little sticky, but I realised I had used a larger quantity. The stickiness though went away in sometime. The second time I used lesser quantity of it and my hair was perfect. The cream is absolutely non sticky if used rightly. Takes away all the dryness( that is what it is for) leaving your hair smooth and silky, it does not weigh down your hair unlike oils. I also love its fragrance. Comes in a Sleek Golden color flip-flop tube which is easy to carry. 1 . 80 ml- 85 Rs. 2. 180 ml - 150 Rs. Take a little blob of cream, rub it on your palms, glide it through your hair.. that's It!! You are ready to style your hair and good to go! Another good thing is it's pricing. When can one use it?? I use it after washing my hair and also sometimes midweek when I feel my hair is getting way too dry. You could use it before sleeping/ before an occasion/ before going out somewhere. Basically Pantene has brought a solution to end the hassles of oiling with this New Oil replacement therapy! Do try this awesome product it is available offline and online too on Amazon and nyaka. Wow!!! That sounds so good. I have oily skin and so avoid oiling my hairs due to pimples. This cream sounds a great solution to my problems. Thank you 😊👍. 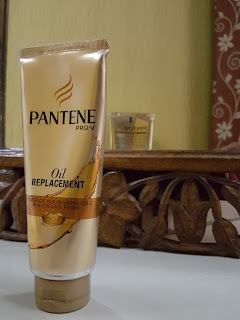 I think it is a great solution for dry hair and we will get the benefits of oiling. Thanks for sharing this review. I heard a lot about thos wonderful product.Hoping to try it out soon. I recently ordered this and I am waiting to try it.. This product is so affordable and looks worth trying. I am planning to buy this soon. I just hate applying oil to my hair. This product is going to be my life Savior. That's a lovely product for all of us oily scalps..loved your review! This is truly a life savior... Oil in cream form is an amazing concept. Will try out. This product is so affordable and looks worth trying. Thank you for sharing.